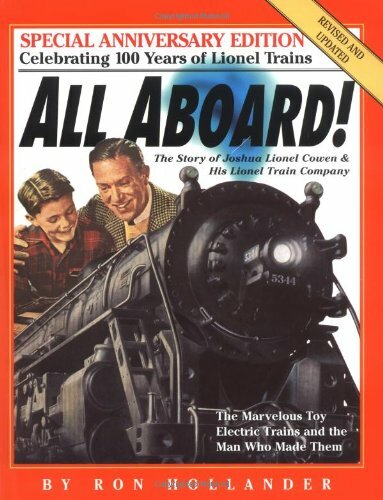 To commemorate the milestone of Lionel Train Company's 100th anniversary comes an updated second edition of ALL ABOARD!, the marvelous story of Joshua Lionel Cowen and the toy trains he created. Originally published in 1981, ALL ABOARD! brings back the classic electric trains for all those who remember them. The Santa Fe came in gleaming silver and shiny red. The New York Central was gray and white. World War I models carried seige guns, a 1957 engine came in pink for girls. There were Pullmans and steam locomotives, Lehigh Valley coal cars, lumber cars, and a design from 1964 that carried radioactive waste and the Mercury capsule. A&E Network named Lionel trains a "Top Ten Toy" of the century-#4 specifically. But the story of Lionel trains is far from over. Co-owned by rock star Neil Young, who bought the company because of his autistic son's love for the trains, the Lionel Train Company is stronger than ever, and is evolving with the times by employing remote control, sound chips, and other technical innovations. 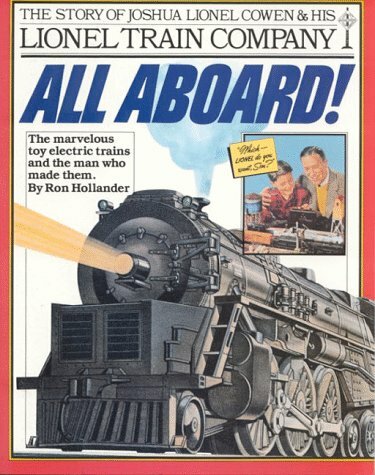 With 32 all-new pages and scores of colorful illustrations from the archives of Lionel catalogs, ALL ABOARD! is the definitive collector's book on the subject. In time to celebrate the Lionel Train Company's 100th anniversary, ALL ABOARD! is the definitive collector's book on Lionel toy trains, brought up to date and enriched with an all new chapter plus a mini-scrapbook of rare stock certificates, patents, and business papers. The unbeatable Santa Fe, the Blue Comet, the Flying Yankee, the New York Central, and World War I models with siege guns. Plus the authentic steam whistle, bridges, tunnels, and crossing gates-everything possible for the layout that made "A Boy Feel Like a Man and a Man Feel Like a Boy."